A few weeks or so after little baby H was born, Mr H and I were having lunch with his sister and she started telling us about this 30 day cleanse she’d been doing, where you basically cut out all gluten, dairy, sugar, alcohol, grains and legumes for a month and then you supposedly feel awesome (and for some people, lighter) at the end. It’s called Whole30 and it’s really popular in the States and is currently growing momentum this side of the pond too. Whilst she was telling us about it I started thinking about how I’d been eating since I gave birth and whilst in terms of the foods I ate my diet was healthy, but I wasn’t eating as well as I could have been. When you have a newborn it’s so easy to forget to have lunch and just pick at some energy balls or raw brownies throughout the day, or to just order a takeaway at the end of yet another wonderful but exhausting day. So Mr H and I embarked on our very own Whole30 cleanse; we made meal plans, did weekly shops, prepped our food in advance and ate healthily and mindfully every day for a month. I honestly felt so good at the end of it – I had more energy, my pre-pregnancy clothes all fitted again and I generally just felt better in myself. There were however just a few things that I really really missed due to being on Whole30; namely peanut butter, oats and most of all, hummus. I’m a serious hummus fiend you see, so I figured if I was going to have to go a month without it I’d need to do what I do best and create an alternative recipe using approved ingredients. Cauliflower proved to be just the ticket – it creates a gorgeously light and nutty dip with just a little hint of a kick to it. 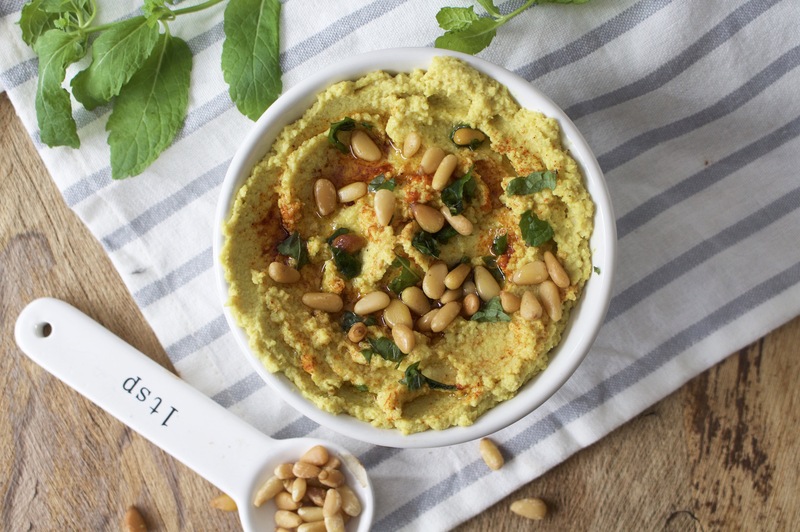 I also added in some turmeric as firstly it’s amazingly cleansing (as it’s an anti-inflammatory) but it also just works so well with the cauliflower and gives this hummus the most incredible flavour. 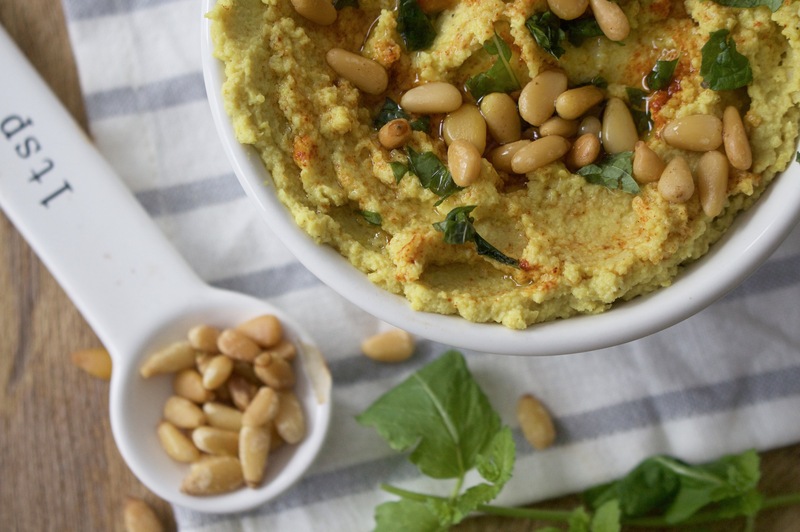 Even though our Whole30 month has come to a close now (at least until the New Year when I’m defo doing it again) I still make this hummus all the time as it’s just so damn tasty. I do hope you love it too! Chop the cauliflower into florets and place in a mixing bowl. Add the olive oil, cumin, salt and turmeric and toss well, then roast in the oven at 180C for 20 Minutes. Leave to cool then pop in a food processor or blender and blend for a couple or minutes until smooth. Drizzle some extra oil on top and serve with a sprinkle of herbs or roasted pine nuts on top.